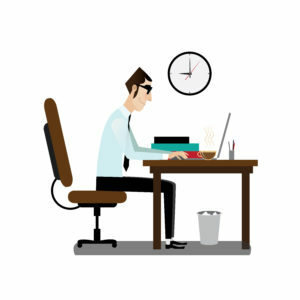 Despite this, 56% of office workers do not take regular breaks during prolonged sitting. This is worrying, considering that 67% are also unaware of the health risks associated with prolonged sitting. These findings followed a report on how the increasing rate of obesity among youths is set to worsen the diabetes rate in Singapore. According to a 2015 review study published in the Annals of Internal Medicine, the amount of time a person sits during the day is positively associated with a higher risk of type II diabetes, heart disease, and even death – regardless of regular exercise. Sit with your feet flat on the ground. Place your left hand on the top of your head and slowly tilt your head to the left. Apply gentle pressure to increase the stretch. Hold for 30 seconds and repeat on the other side. Move your shoulders in backward circular motion so that they are moving in an up, back and down direction. DO NOT roll shoulders forward. Repeat 10 times. While in a seated position, raise up your arm and bend to the opposite side for a stretch. Repeat 3 times and hold for 30 seconds each time. behind your knee/thigh. Repeat 3 times and hold for 30 seconds each time. While standing, bend your knee behind and hold your ankle/foot. Next, gently pull your knee into a more bent position. Repeat 3 times and hold for 30 seconds each time. While standing with feet shoulder width apart and in front of a chair that is facing you, bend your knees and lower your body towards the floor. Repeat 10 times and hold for 2 seconds each time. While standing, bend your knees so that your heels move towards your buttock. Repeat 10 times and hold for 2 seconds each time. Break Up Prolonged Sitting Today! Do you know what the PSI readings mean?